As I'm writing this blog post (on Saturday afternoon, Oct 27, 2012), Hurricane Sandy (or "Frankenstorm") is roaring toward the East coast of the US, and will undoubtedly pound us with a one-two punch by Monday. I'm as ready as I'll ever be. Three bags of chocolate candy? Well, if Trick or Treat gets canceled, someone has to eat it all! I actually learned from Hurricane Irene in August 2011 not to worry about stocking up on raw chicken or beef or anything else that requires cooking (since we lost power for days and I had to throw it all out in the end). Instead I have an assortment of foods we can eat as is: bananas, apples, carrots, two loaves of bread, two jars of peanut butter, grape jelly, cans of tuna, lots of cheese and crackers, juice, cans of almonds. I also have two bags of cough drops and plenty of Nyquil. Yes, I'm sick. My husband went out and bought me the bags of cough drops this morning, and also the last 5 miserable bananas in the grocery store. Why are bananas the first food to sell out when a storm is coming? Enter here to win a SIGNED hardcover copy of GEEKS, GIRLS, AND SECRET IDENTITIES by Mike Jung. You have until Saturday November 3 at 10 pm EDT. International entries welcome. Enter here to win a hardcover copy of TOUCHING THE SURFACE by Kimberly Sabatini, plus a load of swag. You have until Wednesday, November 7 at 10 pm EST. Again, international entries welcome. Stay safe, everyone! See you on the other side. 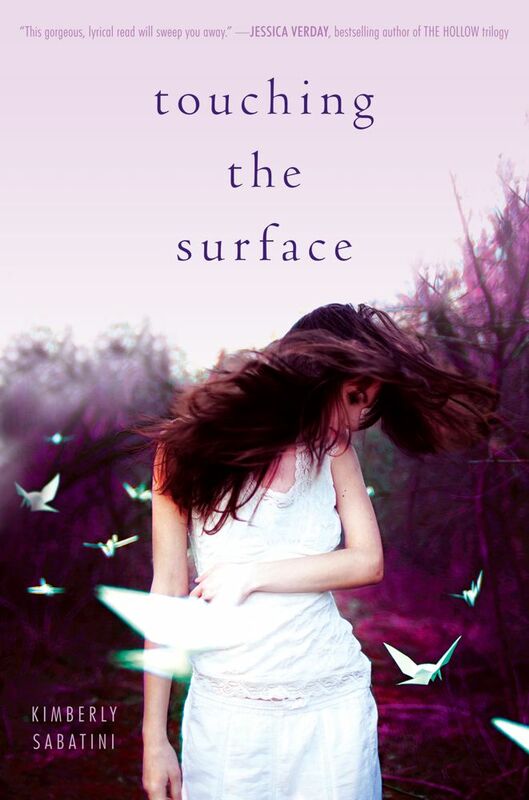 Class of 2K12 - An Interview with Kimberly Sabatini, author of TOUCHING THE SURFACE -- plus a GIVEAWAY! Synopsis (from Indiebound): When Elliot finds herself dead for the third time, she knows she must have messed up, big-time. She doesn’t remember how she landed in the afterlife again, but she knows this is her last chance to get things right. Elliot just wants to move on, but first she will be forced to face her past and delve into the painful memories she’d rather keep buried. Memories of people she’s hurt, people she’s betrayed…and people she’s killed. As she pieces together the secrets and mistakes of her past, Elliot must find a way to earn the forgiveness of the person she’s hurt most, and reveal the truth about herself to the two boys she loves…even if it means losing them both forever. My take: I was lucky enough to receive a review copy of this book, and I can tell you all, it's a ravishing and unique look at the afterlife. The lives of four characters are woven together in an intricate dance after death. As the story unfolds, layer by layer, we grow to love Elliot and her friends and realize the truth of E.M. Forster's famous phrase: "Only connect." Touching the Surface is all about connecting with other lives, and making choices. Even the most minor decision can affect the other people in your life. This is one of those stories you can't stop thinking about long after you've finished the last page. And isn't that cover gorgeous? I'll be giving away my review copy; details at the end of the interview. Did the idea for your book spring from your own childhood or from some other source? And did you start with a character or with an image or phrase or setting? The idea for my book came mostly from the fact that my father had died recently. I think I chose to write a story that took place in the afterlife so that I could explore my own feelings about my where my dad had gone and why he had to leave. It also came from hearing the story of a local girl who had done something “unforgivable.” I couldn’t stop thinking about her. I realized that if I’m so hard on myself about small things, I didn’t know how someone could survive making a life-altering mistake. It made me want to write something that would make her feel better—and make me feel better too. Do you outline before you write? If so, does it end up changing before you finish the first draft? What change surprised you the most? I’m a pantser. A definite fly-by-the-seat-of-my-pants kind of a girl when it comes to a written outline, but that doesn’t mean I don’t plan ahead. I’m a mullet girl at heart. I mull over my story, characters and plot in my head for long periods of time before I write it down. Perhaps you could even call it a mental kind of an outline, because when I sit down to write I have very strong ideas about where I’m headed. But having said that, I’m really open to going where the story leads me. This is when it’s advantageous to be a mental outliner—it’s very easy to make corrections to the master plan. I just head in the new direction and start mulling all over again. I swish my imagination all around until the new ideas are real to me. 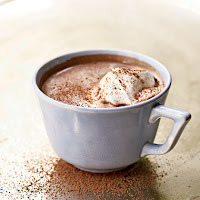 Coffee, tea, or hot chocolate while writing? And where do you write? Briefly describe your writing space. HOT CHOCOLATE!!!! Don’t forget the whipped cream. I have a cute little desk area with a nice window view that I’ve put together with a couple of folding tables. But recently I’ve developed some achy spots from running and dancing and I find that sitting at my desk too long makes my legs hurt. So…I’ve kind of moved my office onto my bed. In essence, I’ve become my cat. We get up in the morning, make the bed, do the mom thing, exercise and/or run errands then curl up in a nest on the bed for the afternoon. Of course the cat gets to sleep on a pillow like a princess and I’m working like a crazy person, but I have hot chocolate with whipped cream—so I’m not complaining. You were the first author I knew to go on Pinterest, when you posted on your blog about your Touching The Surface board. Can you talk about why you're so enthusiastic about Pinterest? How has it helped your writing? I have always been a visual person. As a writer, I very clearly need to see my characters and setting in order to be able to create a believable story. Pinterest is a quick, easy and portable way to visually support my writing. I've always manually built a bulletin board on the wall at home, but now I can write anywhere and access it from any place. I also think it's cool to be able to share an extra layer with readers. Some people don't want to have their own imagery spoiled, which I completely understand, but like myself, many are fascinated with what the author was thinking about when they were writing. I love checking out these kinds of author boards. What can we expect from you next? What are you writing now? Right now I'm revising my second novel, THE OPPOSITE OF GRAVITY. I'm really excited about it and I'm hoping that after the launch of TOUCHING THE SURFACE I'll have a little more time to polish it up. I've also decided to do NaNoWriMo for the first time this November. I know this sounds insane considering it kicks off two days after my book launch, but I feel like I've got book three, CHASING ADAPTATION, knocking on my brain right now. If you see me in a puddle on the side of the road in early December, you'll know that my head exploded. LOL! Ha ha! Good luck with NaNo! And thanks for joining us today, Kimberly! To enter, you must be a follower and you must comment on this post. International entries welcome! Extra entries for tweeting, mentioning on facebook or your own blog. Please let me know. This giveaway ends at 10:00 pm EST on Wednesday, November 7, 2012. Winner to be chosen by random.org. Good luck! *Special thanks to Caroline Starr Rose, for asking me to participate in the Class of 2K12 interviews/guest posts. It was an honor. GEEKS, GIRLS... AND A GIVEAWAY! Okay, the full title of today's MMGM feature is actually GEEKS, GIRLS, AND SECRET IDENTITIES and it's Mike Jung's action-packed debut novel. Yes, I'm giving away a signed, hardcover copy. Holy bananas! Another giveaway?? Yep. Details at the end of the post. Marvelous Middle Grade Monday is the brainchild of Shannon Messenger. For other participants, see my sidebar or Shannon's links. Source: hardcover purchased from Mrs. Dalloway's, an indie bookstore in Berkeley, CA -- wait, did I fly three thousand miles for a booksigning? Heck, no! When I read about Mike's launch, I preordered two copies. One for me. One to give away. And both are signed, including cool superhero doodles. Synopsis (from Indiebound, naturally): Vincent Wu is Captain Stupendous's No. 1 Fan, but even he has to admit that Captain Stupendous has been a little off lately. During Professor Mayhem's latest attack, Captain Stupendous barely made it out alive - although he did manage to save Vincent from a giant monster robot. It's Vincent's dream come true... until he finds out Captain Stupendous's secret identity: It's Polly Winnicott-Lee, the girl Vincent happens to have a crush on. Captain Stupendous's powers were recently transferred to Polly in a fluke accident, and so while she has all of his super strength and super speed, she doesn't know how to use them, and she definitely doesn't know all the strengths and weaknesses of his many nemeses. But Vincent and his friends are just the right fan club to train up their favorite superhero before he (she?) has to face Professor Mayhem again. And if they make it through this battle for the safety of Copperplate City, Vincent might just get up the courage to ask Polly on a date. Why I liked it: Dude! Are you kidding? This would be so much fun if I was a 10-year-old superhero-loving geek! It's fun anyway. And I'm not. Mike has created an original world, lovingly based on comic books, that's a lot like our world, only with superheroes battling bad guys on a regular basis. Vincent and his friends even get Captain Stupendous alerts on their cell phones. Yes, Mike's blog was one of the first blogs I followed, way back in the dark ages of blogging, yo, and I'm totally one of his minions but that's not why I'm pushing his book. 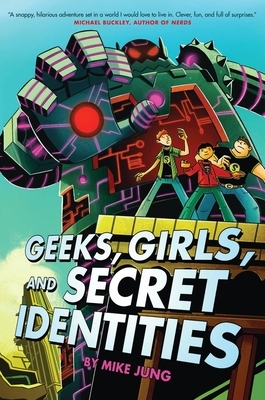 Geeks, Girls, and Secret Identities is a sure hit for both boys and girls in the traditional middle-grade age range. It's crammed with action, realistic dialogue, and humorous situations (wait until you find out why big Max is Vincent's self-appointed bodyguard). It has conflict galore, humungous robots, evil scientists, a first crush, and a group of friends who argue and insult each other but would never let each other down. And there's another reason all this is so cool: Mike can play the ukulele and sing. Yes! I'm thrilled that he chose an indie for his launch party and man, I wish I could have been there! To enter the giveaway for the signed, hardcover copy, you must be a follower and you must comment on this post. Extra entries for tweeting, mentioning on facebook, or mentioning on your own blog. Please let me know you've done that and if possible, give me the links. International entries welcome. This giveaway will end at 10:00 pm on Saturday November 3, 2012. Good luck! Happy 13th Birthday, Lenny Lee! I know an incredible blogger and writer named Lenny Lee and today is his 13th birthday! He's a teenager! If you've never checked out his blog, you're missing something really cool. It's called Lenny's World and he'll teach you so much, it's astonishing. 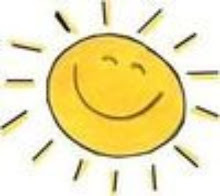 Besides which, he's the sunniest person I know. And actually, there are many many more. But you can check them out yourself by spending some time on Lenny's blog. Go wish him a happy birthday and if you're not already one of his followers, hop over there and follow. And thanks to Sharon K Mayhew for organizing this birthday celebration. UNGIFTED for MMGM -- and a Winner! Congratulations, Michelle! Expect an email from me asking for your mailing address. Now for today's MMGM. Marvelous Middle Grade Monday is the brainchild of Shannon Messenger. For other participants, see my sidebar or Shannon's links. 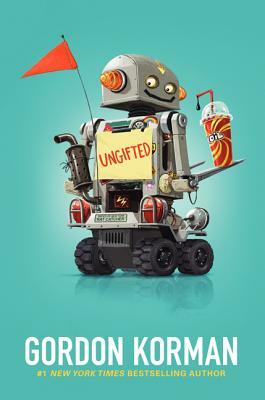 Synopsis (from the back of the arc): The word gifted has never been applied to Donovan Curtis. It's usually more like Don't try this at home. So when the troublemaker pulls a major prank at his middle school, he thinks he's finally gone too far. But thanks to a mix-up, instead of getting in trouble, Donovan is sent to the Academy of Scholastic Distinction (ASD), a special program for gifted and talented students. It wasn't what Donovan intended, but there couldn't be a more perfect hideout for someone like him. That is, if he can manage to fool people whose IQs are above genius level. Why I liked it: It's entertaining and hilarious! Despite being a troublemaker, Donovan's a likeable kid. The POV alternates between several characters, and their names and IQs are given at the beginning of each chapter. So you get Donovan's point of view (IQ: 112) followed by, say, Chloe's (IQ: 159) or Noah's (IQ: 206), or even that of their teacher, Mr. Osborne (IQ: 132) -- and it gives you a different take on what's really going on. Gordon Korman has always been wonderful at making us care about his characters and at bringing out the humor in middle-school situations. I've been a fan of his since way back in the 1990s, with those very funny MacDonald Hall books. 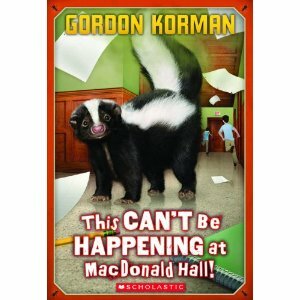 Start with the first one, This Can't Be Happening at MacDonald Hall (which, amazingly, Gordon Korman wrote when he was 12!). Find the author's official website here . Like Bruno and Boots in those books, Donovan Curtis is a troublemaker. He may not be gifted in the traditional sense, but he might just be the one who can pull this group of misfit geniuses together and make them a team. I'd recommend this for anyone looking for a light, funny read and a book that both boys and girls can enjoy. Deb Marshall also recommended this for MMGM, last week. What's your favorite Gordon Korman book? 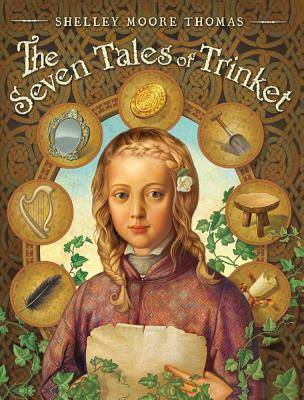 And don't forget my giveaway for THE SEVEN TALES OF TRINKET -- please go to this post to enter. THE SEVEN TALES OF TRINKET and a giveaway! Marvelous Middle Grade Monday is the brainchild of Shannon Messenger. For other participants, see my sidebar. Synopsis (from Indiebound): Guided by a tattered map, accompanied by Thomas the Pig Boy, and inspired by the storyteller’s blood that thrums through her veins, eleven-year-old Trinket searches for the seven stories she needs to become a bard like her father, who disappeared years before. She befriends a fortune-telling gypsy girl; returns a child stolen by the selkies to his true mother; confronts a banshee and receives a message from a ghost; helps a village girl outwit—and out-dance—the Faerie Queen; travels beyond the grave to battle a dastardly undead Highwayman; and meets a hound so loyal he fights a wolf to the death to protect the baby prince left in his charge. All fine material for six tales, but it is the seventh tale, in which Trinket learns her father’s true fate, that changes her life forever. Why I liked it: The best thing about the book, of course, is Trinket! She comes across as very real, human, flawed and yet lovable. She wants desperately to be a good storyteller as her father was, but she's shy about actually telling the stories to people they meet. So she listens and observes and gathers the tales for later telling. I had no trouble guessing what happened to her father, but I doubt a tween reader would figure it out. Filled with vivid descriptions, this book has a decidedly medieval flavor and stories based on Celtic folklore. 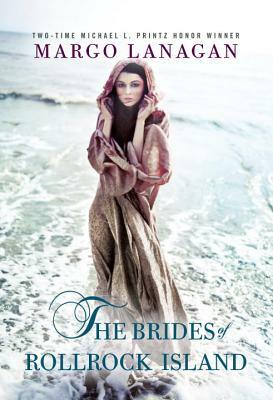 My favorites are the Selkie's tale and the Banshee's tale. The Seven Tales of Trinket would make a perfect read-aloud. You might recognize Shelley Moore Thomas as the author of the adorable Good Knight series of picture books and young readers. This is her first middle grade novel. And here's the giveaway I promised you last week. I will use random.org to choose one lucky winner of my hardcover copy. The rules are simple: You must be a follower and you must leave a comment on this post. International entries welcome. This giveaway will end at 11:00 pm EDT on Saturday October 13 (edited to fix the date! ), 2012. Good luck!